Beading Arts: Which fabric to choose for shibori flower project? 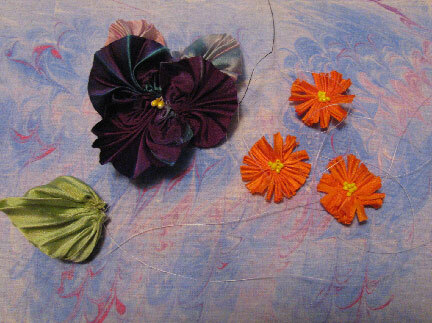 Which fabric to choose for shibori flower project? I want to make a non-wearable piece, just a pretty bead and embroidery picture, and I'm having trouble deciding which fabric should be the background. I started out with a whole bunch of fabrics and narrowed down over a few hours. 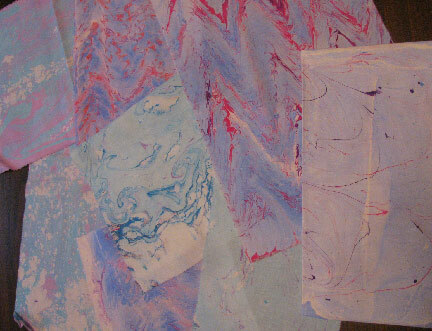 The two contenders are both pieces of muslin that I free-style marbled years and years ago. As you can see, the one above is subtle and doesn't interfere with the focal pieces. BUT, the other has more of the colors of the flowers in it, and seems to be a slightly better match, although it is a busier pattern. Which would you choose? I like the second one. 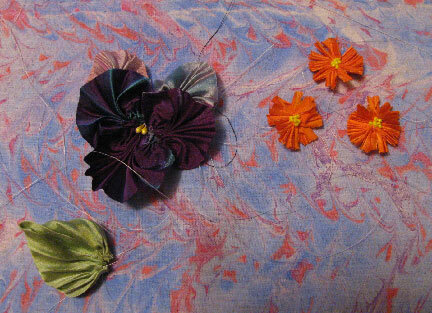 It will look like there are flowers in the distant background as you fill things in. I like the bottom one a little better, even though it's busier. After consideration my personal choice would have to be the top one although it is paler it would add a nice background without conflicting with the flowers that are being added and they will stand out rather than disappear into the fabric, but it really depends on which look you are going for. They really are very similar...I'd prefer the 2nd from bottom...think it has more 'blue' than orange/pink in it...really, hard to tell...and I'm sure you'll make either one work wonderfully!